Comprehensive information about Rosario Castellanos including biographical information, facts, literary works, and more. 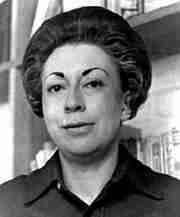 Rosario Castellanos was a Mexican poet and author. Along with the other members of the Generation of 1950 (the poets who wrote following the Second World War, influenced by César Vallejo and others), she was one of Mexico's most important literary voices in the last century. This educational Rosario Castellanos resource has information about the author's life, works, quotations, articles and essays, and more. Articles about Rosario Castellanos or articles that mention Rosario Castellanos. Here are a few random quotes by Rosario Castellanos. Laughter is the first evidence of freedom.